If you are on macOS Sierra or High Sierra, you must have received a notification about available Safari update (when Mojave rolls out, Safari 12 will be mandatory). 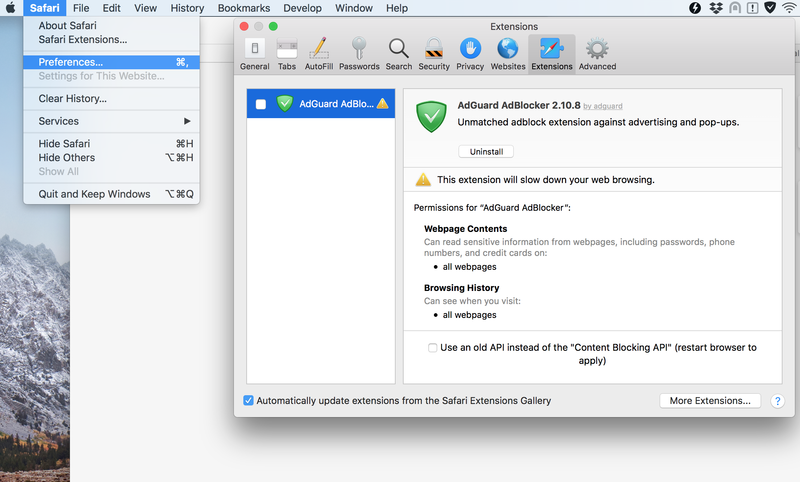 No doubt that there's a lot of cool stuff inside, but we will save the praise for others and instead focus on one change that seriously concerns all AdGuard Browser Extension users: new Safari is breaking all directly downloaded .safariextz extensions. And this is bad news. So, Apple wants everyone to use their new SDK (Software Development Kit — a set of tools that allows to create apps for a certain platform/OS/etc.). And what a better way to do so than to effectively make everything else unusable? They've been making steps towards this goal for quite some time now, and the final blow is due soon. In Apple's perfect world the only place to get Safari extensions from is the AppStore, and those extensions will de-facto be just macOS apps severely restrcited in their capabilities. Why are they doing it and what will happen next? Apple has their reasons, of course. They've been supporting both "traditional" .safariextz extensions and Safari App Extensions simultaneously for a long time, and would have liked to unify everything into a single approach — it will be taking them much less effort and time to maintain a single SDK. But the change in its current form can be devastating for extension developers. Why? Firstly, they can no more share code between Chrome/FF and Safari extensions, which for smaller devs with limited resources will mean they need to choose either one and stick with it. I don't expect many of them to prioritize Safari over Chrome+Firefox. Secondly, creating a new Safari extension will now become a dubious challenge. Let's imagine someone who decides to tackle this task. Not only they need to develop an almost full-scale app, but also do it using a completely different programming language; a task not for the faint of heart. Sadly, all these factors combined may very well lead to an exodus of extension developers from the Mac App Store. Let's see if this prediction will come true. What does it mean for AdGuard? Nothing good, as you might imagine. Despite being present in the Extensions Gallery, our Safari extension used to share a lot of code with Chrome/FF extensions, this will no longer be possible. We almost need to create a new extension from scratch now, and it will definitely be worse, thanks to the new SDK limitations. Perhaps we should find solice in the fact that a lot of other Safari extensions will disappear at all, as it's next to impossible for many of them to transition to the new SDK. How to block ads and protect yourself from trackers now? A lot of angry and sad words have been said so far, but there are actually several ways to go. While your old extensions will be disabled after you update Safari, you are free to reenable them, for now at least. Go to Preferences -> Extensions and simply turn them back on again. This will work for a while, but only for a while. There's zero doubt this workaround is going to be shut down soon enough. As I mentioned, it's going to be less potent than the current one, but hey. It's better than none. We are working overtime to finish it by the end of the month. If Apple makes it hard to block ads with the help of extensions, we offer a standalone solution — along with a solid discount due to special circumstances. Now, our desktop app for Mac is a whole different story. 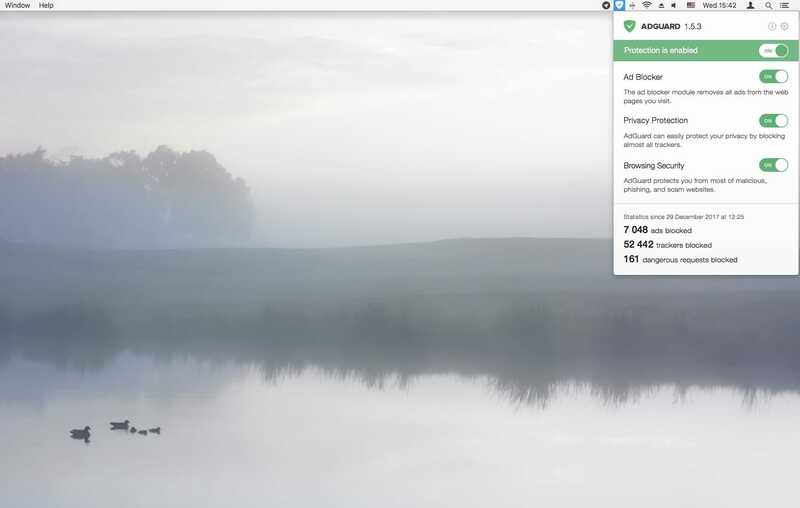 It doesn't care about silly browser stuff, works on the network level like any respectable app would do and also it's simply quite better than any extension ad blocker. You can try AdGuard for Mac for free to see if it's worth it for you, and even get 30% off if you decide to make a purchase. Just follow the link, the coupon is already applied! If anybody needs a link to download Firefox or Chrome, just send me a PM. While Apple users are watching and rewatching the new iPhone presentation, we simple Android folk have our own agenda — for example, new AdGuard for Android version! Let's have a look at the new features.